President Michael D Higgins with Galway writer and broadcaster Tom Gilmore at the events in Castleblayney at the weekend to honour the memory of Big Tom. 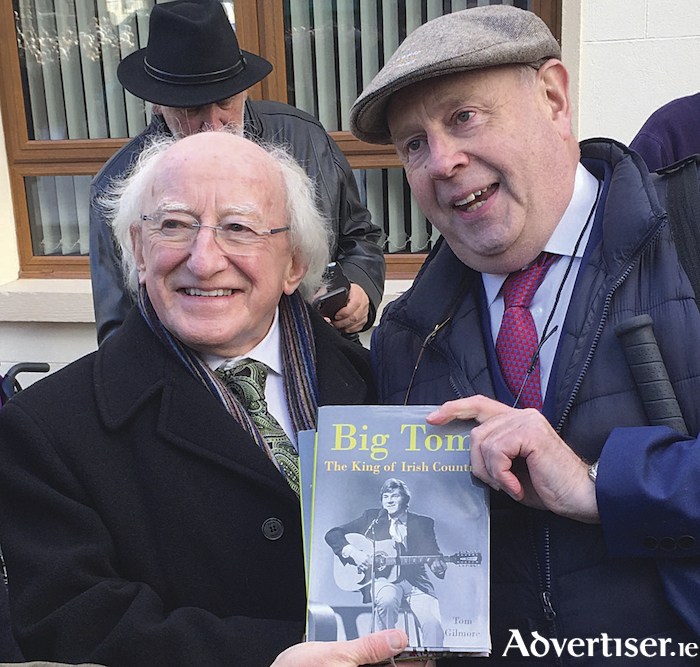 Thousands of fans thronged to Castleblayney at the weekend to see a bronze statue of Big Tom unveiled by President Michael D. Higgins and the launch of the official biography titled Big Tom – The King of Irish Country by Galway author and broadcaster Tom Gilmore from Bodane, Tuam. Mr Gilmore, a journalist with wrote with distinction for the Tuam Herald and broadcast news and music on Galway Bay fm for decades, is one of the country’s foremost experts on C&W and Country & Irish music. He penned the book over the last year, drawing on his extensive knowledge of, and many long interviews with Big Tom McBride. The book is a treasure trove of facts for Big Tom fans and many of them might not have known that he admired The Rolling Stones because they played their instruments in the studios as did his band The Mainliners so what you heard on stage was what you heard on record. The book recalls the strange story of Big Tom being asked to sign an autograph for a fellow who said he was Mick Jagger! While it is not certain if it was the Rolling Stones frontman or not, Big Tom just signed the autograph anyway and wittily remarked “you look like him too”! This book aims to be a microcosm of some of the many facets of a music career that was different to most. It reflects the life of a legend on the Irish music scene as seen through the eyes of his family, friends, fellow musicians and fans. But perhaps most importantly many of the words of the big man himself are here in numerous interviews with him, including one lengthy one that he did with Tom Gilmore when they spent a few hours doing a radio programme in the singer’s home some years ago. The writings, broadcasts and TV work of many other media people has also been a rich vein of research for the book. “All of this plus the family’s own memories of their brilliant dad Tom and their mum Rose gave me an invaluable insight into the life of the star, away from the spotlights, and where he was happiest of all, living among the ones he loved,” he says. The book is the latest tome on country music from Tom Gilmore, who is currently working on several new books, details of which will be revealed next year. It is available at all bookshops now at €19.99 or by post from Easons, Kennys, Amazon and many other booksellers. An e-book version is also available. Page generated in 0.2009 seconds.